I’ve become a bit of a Think Geek junkie. I love their outside of the box toys and items – definitely appealing to the geek at heart and definitely not your mainstream items. 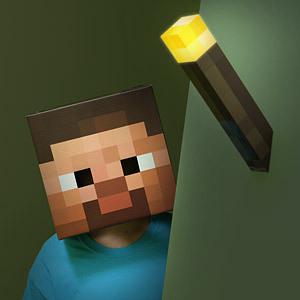 I got a number of things from them for my boys for Christmas and I’m now eyeing up this Minecraft Light Up Torch ($34.99) on ThinkGeek.com. What do you guys think? This is probably a bit excessive for my 9 year old’s Easter basket, right? Because I need an excuse to get it – he’d just love it!